SPACEPORT NEWS September 2, 2005 Page 2 W illiam Roy credits the upbeat atmosphere in his workplace for helping to inspire his success at Kennedy Space Center. But its Roys outstanding commitment to his coworkers and KSCs facilities that led him to receive NASAs Exceptional Service Medal Aug. 4. He earned the award for helping to ensure the safe and efficient use of Kennedys institutional property and systems. Roy is currently a logistics engineer with the International Space Station/Payload Processing directorate supporting the Vision for Space Exploration. However, he was working for the Cape Canaveral Spaceport Management Office when nominated for the award. In that role, he was the NASA Integrated Product Team lead of Logistics Operations in support of the Joint Base Operations and Support Contract. I provided government management and oversight of Base Operation Logistics for the Cape Canaveral Spaceport, which includes more than 500 contractors and a budget of approximately $50 million, said Roy, who has worked at KSC for 17 years. The family atmosphere of the directorate and the diversity of the work force, combined with working in the Air Force/NASA partnership, provided a great learning environment. Among the reasons he received the recognition were his outstanding leadership, ability to recognize and resolve conflicts, excellent teamwork and contract management and dedication to aligning his actions with NASA and KSCs goals. I was quite surprised and honored to be selected. However, I was more privileged having been nominated by my former directorate, he said. Roy and his wife, Laura, have two children: Kathleen, 21, and Billy, 11. He takes family vacations and does home improvements to reenergize for work. The NASA Exceptional Service Medal is awarded for significant achievement or service leading to substantial improvement in engineering, aeronautics, spaceflight or space-related endeavors, or administration and support of these endeavors which contribute to the programs of NASA. NASA family inspires Roys role as leader By Jennifer Wolfinger Staff Writer NASA is marshaling Agency resources to assist Gulf Coast-area facilities that suffered damage from Hurricane Katrina. The Agency is preparing to provide help for NASA employees and contractors whose homes were damaged or destroyed. Mondays storm hit NASAs NASA assesses damage from Hurricane Katrina From the Administrator:My heart goes out to all the people affected by this hurricane. I will be visiting Stennis and the Michoud Assembly Facility soon to talk with our people. We also are grateful that the Stennis Space Center provided shelter to 4,000 people  NASA employees, contractors and family members and stranded local residents  as the hurricane moved through. The Stennis Space Center is still being used as a shelter location and the Centers parking lot is being used by Federal Emergency Management Agency officials as a staging area for recovery operations. The Stennis Space Center and Michoud Assembly Facility will be closed for business while recovery efforts continue. Currently, Emergency Operations Centers at the affected Centers and Headquarters are now open and will remain open during business hours as needed. As emergency crews begin the difficult work of clearing debris and restoring power and other services to the facilities on site, we also are assessing how resources across the entire Agency can best be used to offer support to the Stennis Space Center and Michoud Assembly Facility. The Marshall Space Flight Center is already helping tremendously by serving as a hub for off-site emergency procurement activities. Two helicopter flights from Marshall delivered communication equipment and other supplies to the facilities this week. In the coming days and weeks, we want to make certain our colleagues and their families get the help they need. While there is considerable federal and state assistance on the way, NASA employees can get involved by contributing to the NASA Family Assistance Fund at http://www.feea.org The NASA Family Assistance Fund will provide a grant of up to $400 and an interest-free loan of up to $600 for people living in declared disaster areas. L ast year, most employees at KSC felt the wrath of several hurricanes that crossed the state of Florida. Because of our own personal experiences, we have a particular empathy for our fellow workers at Stennis and Michoud following the devastation of Hurricane Katrina and the long recovery period sure to follow in the weeks and months ahead. Our hearts and prayers go out to our co-workers who may have lost their homes as a result of this terrible tragedy. At right is a special message from NASA Administrator Mike Griffin. Please read and consider making a contribution to the NASA Family Assistance Fund on behalf of those at Stennis and Michoud. Bruce Buckingham Managing Editor, Spaceport News Stennis Space Center in Mississippi and Michoud Assembly Facility in New Orleans, which is operated by Lockheed Martin. Both facilities are closed during recovery efforts. During the storm, hundreds of people including employees, family members and others took shelter at Stennis. A small contingency of NASA employees and contractors rode out the storm at Michoud. There are no reports of any injuries at NASA facilities. NASAs Marshall Space Flight Center, Huntsville, Ala., sustained minor damage and is providing support to Stennis and Michoud. Two helicopter flights from Marshall were delivering communication equipment and other supplies to the facilities today. Initial damage assessments indicate some buildings at Stennis sustained water and roof damage, but the exact extent has not been determined. The Federal Emergency Management Agency is using the center as a staging area for local recovery efforts. The Centers Space Shuttle main engine test stands do not appear damaged. At Michoud, which makes the Space Shuttles external fuel tanks, several buildings suffered window and roof damage. It appears that space flight hardware was not damaged, but a preliminary assessment has not been completed. The facility has no electrical power and communication is limited. Debris on roadways is restricting transportation around the facility. 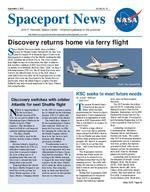 Page 5 SPACEPORT NEWS September 2, 2005 o rnia and safely home to Kennedy (CENTER LEFT, TOP) Shuttle Launch Director Mike Leinbach (facing camera left) and Space Shuttle Discovery (OV103) Vehicle Manager Stephanie Stilson (facing camera right) are interviewed by the news media at the Shuttle Landing Facility. (CENTER LEFT, BOTTOM) In the early morning hours, the orbiter Discovery is being demated from the Shuttle Carrier Aircraft beneath it. (LEFT) Discovery is suspended within the mate/demate device after the SCA has rolled away from beneath it. (CENTER, TOP) SPACE Shuttle Discovery, atop a modified Boeing 747 Shuttle Carrier Aircraft (SCA), touches down on runway 15 at the Shuttle Landing Facility at about 10 a.m. on Aug. 21. The cross-country ferry flight became necessary when two days of unfavorable weather conditions at KSC forced Discovery to land on runway 22 at Edwards Air Force Base, Calif., on Aug. 9 following mission STS-114. (LEFT) DISCOVERY is slowly lowered toward the ground from the mate/demate device. Its wheels were lowered and the orbiter rolled back. Discovery was then towed to the Orbiter Processing Facility for further post-launch processing. SPACEPORT NEWS September 2, 2005 Page 7 National Space Club recognizes three space pioneers By Jeff Stuckey Editor J ust hours before Jim Harrington received the Lifetime Achievement Award from the National Space Club Florida Committee, fate seemed to give the former Space Shuttle launch director a fitting tribute, as well. Harrington, who served as the launch director between 1995 and 1997, helped develop the techniques to ferry the Space Shuttle back to Kennedy Space Center from California. His hard work led to the culmination of efforts that brought Discovery safely home to KSC Aug. 21. We learned a lot from that first flight, Harrington said. It originally took about four weeks to return the Space Shuttle to Kennedy, and now its about seven days. The team that traveled from Kennedy were the can do type of people, so we came up with the answers to get the Space Shuttle back safely. Harrington, along with H.P. Al Bruckner and Lou Ullian, received the awards at a National Space Club luncheon Aug. 9 at the Doubletree Hotel in Cocoa Beach. Bruckner, who was unable to attend the ceremony, was director of the Eastern Test Range for Al Shepards first space flight. Ullian was director of range safety in the early 1960s and was known as the man when it came to anything range-related. Harrington and his co-workers had to overcome adversities the first time NASA landed the orbiter Columbia at Edwards on STS-1 in 1981. Although this was not the first time NASA performed a ferry flight, engineers had to complete post-landing processing and safety procedures. There were also some procedures not performed by the crew that we had to work through after landing, such as the repositioning of the main engines after landing, which is part of the process now, Harrington said. No one thought of repositioning them until we realized we could not get some of the platforms around the orbiter until the engines were moved. He said his biggest achievements were having the honor to work with the launch team at KSC for many years and helping to develop the Space Shuttle Program. They are a wonderful group of people at Kennedy who have always been dedicated to their job. Ullian and his team faced difficult situations. He was tasked with storing the recovered parts of the Space Shuttle Challenger after its accident and ensuring these parts contained no hazardous materials. We also had to develop ways to pick those parts off the bottom of the ocean with live ordnances still on board, he said. Ullian fondly remembers getting a call in the middle of the night from Mercury astronauts Gordon Cooper and Scott Carpenter, who had found a pair of bulldozers near Sebastian Inlet and took them for a ride on the beach. Theyd gotten the bulldozers stuck in the sand when high tide rolled in, and the men called Ullian to help them out of their situation. Ullian immediately dispatched a tow truck to the beach and had the bulldozers towed out and placed back in their locations before anyone noticed. Not many people know about that story, Ullian proudly shared. For more information about the National Space Club Florida Committee, visit www.nscfl.com .AT LEFT, Lou Ullian (right) holds his award with his son, Mike, and wife, Helen. At right, Jim Harrington displays his award with his wife, Jean. T he 2005 Thermal and Fluids Analysis Workshop (TFAWS) was held at University of Central Florida (UCF) from Aug. 8-12 to help the thermal and fluids analysts of government, industry and academia keep up-to-date with the latest technologies. As part of the workshop, attendees toured Kennedy Space Center on Aug. 10. The workshop featured speakers from NASAs Space Shuttle Program and Jet Propulsion Lab and research scientists from across the country. By hosting the workshop here in Florida, we want to make a statement that KSC is not only an operational center. We also possess research and development capabilities, said Michael Lonergan, thermal analysis lead at KSC and chairman of this years event. Kennedy hosts Thermal and Fluids Analysis program DR. WOODROW Whitlow, Center deputy director, welcomes participants from the 2005 Thermal and Fluids Analysis Workshop at the Debus Center. Page 8 SPACEPORT NEWS September 2, 2005 John F. Kennedy Space Center Managing editor. . . . . . . . . . . . . . . . . . Bruce Buckingham Editor. . . . . . . . . . . . . . . . . . . . . . . . . Jeff Stuckey Copy editor . . . . . . . . . . . . . . . . . . . Corey Schubert Editorial support provided by InDyne, Inc. Writers Group. NASA at KSC is located on the Internet at http://www.nasa.gov/centers/ kennedy USGPO: 733-049/60089 Spaceport News Spaceport News is an official publication of the Kennedy Space Center and is published on alternate Fridays by External Relations in the interest of KSC civil service and contractor employees. Contributions are welcome and should be submitted two weeks before publication to the Media Services Branch, IDI-011. E-mail submissions can be sent to Jeffery.Stuckey@ksc.nasa.gov ODT . (Continued from Page 1) Atlas Agena Complex 13 bites the dust after 40 yearsC omplex 13, the site of launches of Atlas Agena vehicles for more than two decades, was demolished Aug. 6  more than 27 years after supporting its last launch in April 1978. Most launches were for the Air Force, but NASA had several key launches from Complex 13 also. All five Lunar Orbiters were launched from Complex 13 between August 1966 and August 1967  five within a year and all successful. The Lunar Orbiters led to the Apollo landings. They took tens of thousands of pictures of the lunar surface, pictures which were instrumental in picking the Apollo landing sites.GOING. . going. . gone. Complex 13 supported 51 Atlas and Atlas/Agena launches during its active period, which lasted nearly 40 years. THE NASA August Employees of the Month, from left, are William Patrick, Shuttle Processing; Ken Nowak, Space Shuttle Program Office; Scott Thorne, Chief Financial Office; Margaret Hinds, Information Technology and Communications Services; Brian Graf, Center Services; Keith Schuh, Launch Services Program. Not pictured are Chris Dundas, Safety and Mission Assurance; Terri Holbert, International Space Station/Payload Processing; Shannon Potter, External Relations; and Cathy Hope, Spaceport Engineering and Technology.Employees of the Month for AugustPlanning; Sheryl Marshall (TA), Moves; and Michael Bell (EA), Business Systems. Communications will provide the work force with timely and accurate information through weekly progress reports, supervisors, organization representatives, a Web site, e-mails and other channels. KSC was assigned a significant role in Exploration, and its exciting to think about execution of those roles, said Fox. Reorganizations are disruptive. We care about the people and some will be affected more than others, so the transition will go better if we communicate early and often. The Communications Team representatives are Jack Fox (XA, lead); Gisele Altman (AJ); June Perez (BA); Robert Hubbard (BA), Doug Hendriksen (CC); Hugo Delgado (EA); Amiee Bergquist (GG); Retha Hart (IT); Lori Weller (JP); Randy Segert (MK); Mike McCarty (OP); Henry Schwarz (PH); Lisa Singleton (SA); Dianne Callier (TA); Terri Holbert (UB); Damon Stambolian (UB-X/RA); Ron Mueller (VA); Yvonne Fuchs (YA); and Web site support by Laurie Brown (IT). The Design, Development, and Sustaining Engineering ODT is identifying work functions and organizational structure to design, build and sustain the launch site for Exploration. The work would include facilities and systems modifications, as well as the development of ground support equipment. Team members include Scott Kerr (TA-lead); Rita Willcoxon (YA); Dave Bartine (YA); Oscar Toledo (EA); Mike Sumner (TA); Bruce Hevey (IT); Bonni McClure (BA); and Phil Meade (BA). The Exploration ODT is developing work functions and organizational structure for KSCs potential and existing Exploration roles and responsibilities. This includes flight hardware processing, integration, launch, recovery, refurbishment, logistics, and all associated facilities and ground systems. The team is also ensuring that KSC is aligned with proposed program structure and the other Centers projects. Team members include Tip Talone (UB-lead); Shannon Bartell (RA); Shawn Quinn (RA), Kelvin Manning (UB-X); Ruth Gardner (UB); Jennifer Kunz (UB); Robert Cannon (BA) ; and Rebecca Lewis (BA).